Fingerless have been writing, recording and performing music since 2009 as a solo acid/folk outfit. Back in 2011 their first album “5:18” was released through 777 operations, and the following year a second album “Organ Control” was self-released. In 2017 “Does It Really Though?” was released, followed by a hypnotic video for the EP’s single “Aimee’s Train.” Last year Fingerless began gathering more musicians so as to continue their sonic experimentation both in the studio and on the stage. 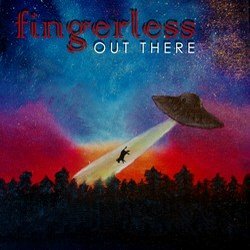 ‘Out There’ is the third release in 2018 from the refined, redefined, reinvented, and reinterpreted musical musings of Fingerless.